This new book from Outdoor Life Magazine covers 221 topics in fishing, hunting, trapping, wild plant foraging, herbal medicine, camping and survival. Live off the land! Hunt like a caveman, eat like a king! A manual for the modern hunter-gatherer, The Ultimate Survival Food Manual has everything you need to know about foraging, hunting, and cooking in the wild. Learn the best tactics for living off the land, from eating wild plants to subsistence hunting. Whether you’re using modern weapons, old-fashioned snares, or your own two hands, this book will show you the amazing range of hands-on (literally!) methods for catching and cooking your prey. Use the detailed field guides to gather edible plants, nuts, and mushrooms, then turn them into gourmet meals with field-tested camp cooking tips. Prepare for any emergency, whether you’re lost in the woods or surviving a natural disaster. Find local, organic foods, and grow them yourself. Learn the secrets of herbal medicine and traditional remedies. This book demystifies it all, with simple hints and step-by-step illustrations to make you a self-sufficient survivor—in your backyard and in the wild. Who Likes Hunting and Gathering Survival Manual ? 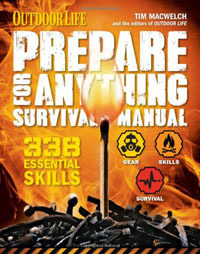 This book from Outdoor Life Magazine covers 338 essential skills for survival, emergency preparedness and self-reliance. All over America, families are transforming spare rooms into long-term storage pantries, planting survival gardens, unplugging from the grid, converting their homes to alternative sources of energy, taking self-defense courses, and stocking up on just about everything and anything imaginable. So what are all of these people preparing for? The motivations may vary, but the general consensus is that our world is becoming increasingly unstable, and there are a whole host of civilization-endangering events to be concerned about. Prepare for Anything will take you through these potential threats and teach you how to become prepared for them, from how to strategize and the right gear to your actions in the wake of a disaster—or simply how to get back to the land and become less dependent on the system. This is the book for the growing prepper movement, with hands-on hints, easy-to-use checklists, and engaging first-person stories to break down the crucial do’s and don’ts, educate yourself on various threats, and help to ensure that you ride out whatever Mother Nature, the government, foreign powers, or modern society can throw at you. Who Likes Prepare For Anything ? Survivor Jane said "Prepare For Anything is easy to read and understand, using terms that both a new prepper or those more seasoned can glean from. He not only talks preparedness, he lives it." DC 101 personality Elliot in the Morning loved the book! Here's our in-studio interview. Outdoor Channel star Trav Ferguson said that Tim and his book were "So awesome it hurts!" Listen to the August 2014 interview on The Revolution Radio Show with Jim and Trav. As of January 2015, over 61,000 copies of Prepare For Anything have been sold. Prepare For Anything was on the New York Times Best Sellers list for December 2014 and January 2015.